On Friday, November 8, 2013 the Indianapolis International Airport Interfaith Chaplaincy (IIAIC) dedicated a new Chapel / Meditation room. IIAIC funded the re-modeling project and furnishings of the new room. Airport officials, IIAIC board members, Indianapolis area clergy, and a number of donors attended the interfaith dedication service. The meditation room was named after a board member of the Indianapolis Airport Authority, Gene Haflich. ISNA‘s past Director of Membership, Ashfaq Lodhi, serves on the board, and has served as the Muslim Chaplain since 1996. 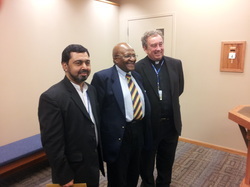 Chaplain Lodhi is pictured here alongside Archbishop Desmond Tutu, and Fr. Glenn O’Connor, Catholic Chaplain and Minister at St. Suzanna’s in Plainfield, IN. ISNA’s Director of Chaplaincy Services, Abdul-Rasheed Muhammad also attended the dedication ceremony. The chaplains observed a moment of silence alongside TSA agents at 12:20 pm. This was to honor the fallen TSA agent in the Los Angeles airport shooting last Friday, November 1, 2013. Chaplains provide various interfaith services and support to Airport employees, travelers and visitors to the airport.